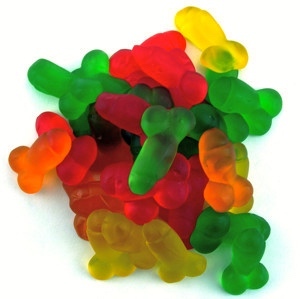 A new item in the inventory of edible penises — gummi candies — but now with the penises viewed as insulting rather than (as in earlier postings on the subject) entertaining. Two, two, two insults in one. This article seems obsessed with the idea that only an enemy would deserve a bag of edible dicks. Clearly they are clueless as to the marketing potential for this product. On this blog: Gummi Vitamins in a posting on 11/25/12. This entry was posted on March 19, 2015 at 3:44 am and is filed under Insults, Language and food, Phallicity. You can follow any responses to this entry through the RSS 2.0 feed. You can leave a response, or trackback from your own site.